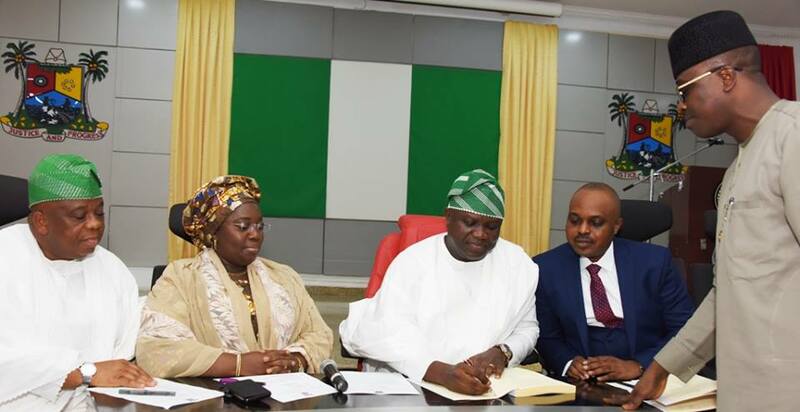 Governor Akinwunmi Ambode of Lagos State on Wednesday signed the Environmental Management and Protection Bill into law, expressing optimism that it would go a long way to secure the public health safety of residents most especially children. Governor Ambode, who spoke shortly after signing the Environmental Management and Protection Bill into law at the Lagos House in Ikeja, said that his administration, on assumption of office, saw the need to address the gap in the sanitation of residents and the state. He said it was disconcerting to see that dysentery and other pandemics were on the rise with serious implications for the state’s public health expenditure, adding that the government thought it wise to tackle the root cause of the problem rather than spend excessively on treating preventable hygiene based diseases. Governor Ambode added that aside the fact that the initiative would create at least 27,500 jobs, the Community Sanitation Workers (CSW) who would be engaged will receive several incentives including tax reliefs and healthcare, life, injury and accident insurance benefits all aimed at tackling the issue of poverty and the chronic unemployment crisis. According to him, the major motivating factor outside of the financial burden was the fact that children were the greatest casualties of the poor management of the environment, hence the need for the initiative. Alluding to the fact that majority of the state’s environmental laws were outdated and could no longer apply to the present-day conditions, the Governor said the government immediately swung into action and began efforts to develop a model in which sanitation is paramount. “While charting a new direction, it became quickly apparent that government on its own would struggle to bear the cost of the wholesale changes while meeting its other obligations across other equally vital sectors. “It was necessary to make investor friendly laws that attract the type of capital we need to further our development agenda and achieve our sustainability goals. We believe it is worth the risk involved in changing the legislative framework if the reward is a healthier and cleaner Lagos for our children – our future,” the Governor said. Governor Ambode said that under the Cleaner Lagos Initiative, the commercial sector would be serviced by licensed waste management operators while an environmental consortium will provide waste collection, processing and disposal services for residential properties through a long term concession. He said over the concession period, the consortium would be deploying a large multi-dimensional fleet of over 20 landfill and transfer loading station management vehicles, 590 new rear-end loader compactors, 140 Operational vehicles and close to 900,000 new bins to all be electronically tracked and monitored by our new unit PUMAU (Public Utilities Monitoring Assurance Unit) under the Ministry of Environment. “Everyone from the cart pushers to the existing PSPs and casual workers at the dumpsites have been considered in the plan and will be accommodated within the new environmental regime. “In addition, we are extending opportunities to everyone along the value chain by working to create vocational training in the related areas through LASTVEB,” he said. Giving details of the law, the Governor said that sanitation will now be a daily affair in the state while the CSWs would be deployed in every ward across the State. He also said that an annual Public Utility Levy (PUL) would be introduced to replace all service fees previously paid to the Waste Management authorities, adding that the public was carried along in determining the rates, which according to him is relatively low. “The PUL will be a major contribution to the state’s ongoing efforts to address severe challenges that are unique to Lagos because of rising urbanization. The money will be held in the Environmental Trust Fund and managed meticulously by a Board of SEC regulated trustees. “The trustees are under strict obligations to the people of Lagos and will be accountable to the people for every naira we spend in line with our overall environmental agenda. Compliance is the key. The burden of the cost of providing these services will remain low if everyone does their part and pays their PUL. “With the newly positioned LASECORPS, we will work within the community to enforce the new laws. The State will have a zero-tolerance policy for offenders because simply put, disregarding payment of your PUL or flouting the new regulations ultimately promotes activities that lead to the loss of lives,” Governor Ambode said. Earlier, the Chairman, Lagos State House of Assembly Committee on the Environment, Mr Saka Fafunmi, commended the Governor for his passion to evolve the environmental laws in the State, saying that the Law would ensure a cleaner, safer and more prosperous Lagos. Recently, the Governor cancelled the monthly environmental sanitation exercise normally held on the last Saturday of the month.